"Lapwing eggs - or plover eggs as they were known - had turned into a vast commercial market with reports of basket after bucket of plover eggs for sale in London's markets at Easter. Queen Victoria favoured her plover eggs cooked in aspic and Mrs Beaton supplied several recipes for the discerning cook. With this demand came dedicated teams of 'egg pickers'. In 20 years they had stripped the whole of the south of England as far up as Lincolnshire. By the end of the 1880's plover eggs had to be ferried in from as far a field as the Scottish highlands and Holland. It was only in 1926 and the introduction of the Lapwing Act did this officially stop. It is from this wild harvest, however, that historians believe lie the origins to the classic Easter custom of the egg hunt. Lapwing eggs hidden in the long grasses would be fairly difficult to find and the children's garden egg hunt is most likely mimicking this pursuit." 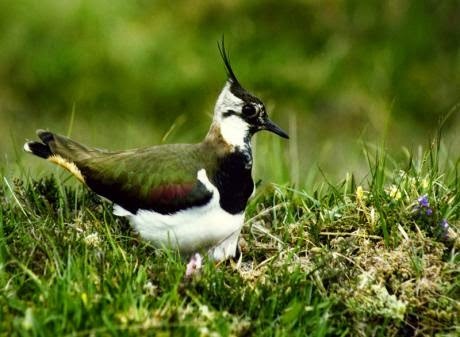 Read more about the current status of the lapwing in England here.